I drew myself in Derwent Drawing Pencils on Canson Mi-Teintes paper. I decided that, as a portraitist, I needed a self portrait for my avatar. In the past my self portraits, drawn by using a mirror, had a concentrated glare, or at best an aloof look. 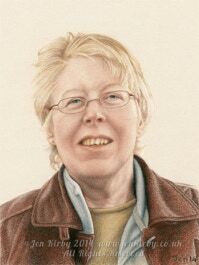 A friend even asked me if one portrait was of my mother so it obviously didn't look quite like me! I needed a self portrait with an expression that is typical of the me that my friends would recognise, so here I used a photo that my son took of me. I used the Derwent Drawing Pencils. I like Conté crayons too, but the Derwent pencils are waxy and don't smudge as easily. Both types have wonderful earth tones that are ideal for a style of portraiture inspired by the old masters' sketches in sanguine. For the portrait of a person I work on a cream paper which gives the lighter skin tones and use Venetian Red for the features and shading.